I walked in to the guest room a few weeks ago to find Emma on her knees, on the floor, hunched over something. She was obviously working quietly and intently, and secretively. I stepped closer and she looked up. In front of her on the floor was a whole battery of off-limits items from my craft stash–sewing scissors, expensive yarn, scraps of fabric, rubber stamp pads, good heavy papers and permanent markers. I felt my blood boil. "EMMA!!! WHAT are you doing??! These are my things!" "I had this idea. ", she said with a defeated sigh. I was still upset. This had been happening a lot lately. The sneaking off while I was occupied elsewhere in the house. The getting in to things that normally require supervision. Craft stuff. Food from the pantry. Gardening tools. Things that stay inside the house being dragged outside. It was making me crazy. Didn't my children understand any boundaries? Didn't they realize they couldn't get into anything and everything, whenever they pleased? I questioned her further, "Why didn't you just ask?" "Because I knew you'd say no. You always say no." And there it was. I was confronted with the truth. Or at least what felt like the truth to her. Now obviously, I don't say no all the time. But sometimes, I think my pile of "no's" far outweighs my pile of "yes". In fact it could easily bury the pile of yes. 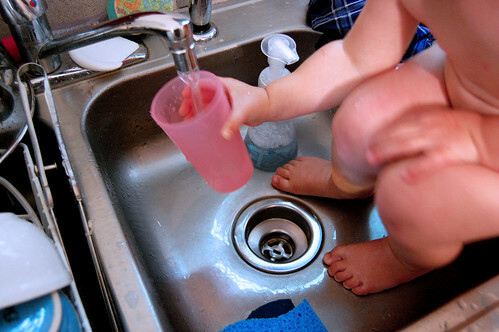 Sometimes the no's come from exhaustion–the not wanting to make another mess, the not wanting to break open all the paints or get out the sewing machine, the not wanting to fill another sink with dishes, the not wanting to hike to the stream and carry home dirty toddlers and ten pounds of streambed in a metal bucket. And sometimes, I catch myself saying no because I think that's what I'm supposed to say. It's what parents do. That somehow I'm teaching them some life skill–to wait, to be patient, that you don't always get your way. And then I find myself thinking, "Now wait. Why did I say no to that?" And I also realized in some odd way, my barrage of 'no's' was driving Emma to deception. She had ideas and plans that were burning inside of her. Things she had to try. Experiments she had to concoct. Recipes she had to make. She needed to bring these ideas in her head to fruition. And sometimes, the supplies she had at her disposal–some watercolor paints, construction paper, a pair of tiny right-handed scissors, just wouldn't cut it. And more often than not, when she brought her plans before the queen of the house, she was shot down before she even got started. You've heard me say it a hundred times before, this job of parenting is a continual learning process. And once again, I've learned a lesson. I'm not saying all my no's have magically become a yes–I'm not planning to let Emma float Elizabeth down the stream on an inner tube anytime soon. However, my no doesn't come as quickly these days. I don't want her to give up on me. To think she has me figured out. To decide that I'm always a no. I want to say yes sometimes. More times. I want to surprise her. I want to follow through on a few of those crazy ideas and see just where that idea takes us. I want her to tell me everything because she knows I'll be just as excited and curious and creative as she is. I'll say no, when a no is what's really called for. But more than that, I want to be a yes. I have been struggling with this very same issue lately and tonight I was at my wits end when I found my daughter had ruined her bed sheets with permanent ink. I feel better after having read your post and I too, want to try and say “YES!” more. Thank you. Oh, I wrote a post on this just over a year ago. It’s called Yes: http://www.suchthings.ca/my_weblog/2008/04/yes.html Yes, Yes, Yes to saying yes! Thank you so much for this post. I needed it today. I’ve had a frustrating fortnight of things that I haven’t even blogged about. I need to say “yes” more often to my daughter’s suggestions but fatigue gets in the way and I say “no” instead. I need a new spirit. I just spent more time than I would like to admit scrolling through the creative labyrinth of your blog. Believe it or not I finally came to your blog due to reading an article featuring your blog several years ago; it was Artful blogging Spring 2008 by the way. Your partial post of “friday afternoon” about leaving little slips of uplifting messages in random public places has never left me. I brought this old magazine on vacation with the intent of re-reading my fav. articles to inspire me to start my own blog.I love reading about, and tearful sympathize with all you have to say, in particular about mothering. (Collicy baby: check – Kids who drag your crap out without asking but then somehow make YOU feel guilty: check)Your lists rockThe bad news is your blog is so varied, hip, and poignant that I may not clean a thing, or cook a meal all week, trying to get my newborn blog some meaty layers, and lovable rolls of its own. Oh my. This rings a very loud bell for me. I feel that I spend quite a bit of time repairing all the no’s I have said to my 8-year-old daughter over the years. Like your daughter, she has developed many clever ways to carry out her ideas without my knowing. I think we mamas say no because we are tired, because we don’t want the messes and bother, and because, unlike children, it is harder for us to think outside the box. I like the note on your hand. Could I get that permanently tatooed on? this is a lesson that i really need to learn. i find myself saying no more often because i don’t want to deal with what i think the outcome will be. then again, i never see the outcome because i always say no. i have a feeling we all might be surprised if i said yes more often. I want to be a yes too! Thanks for the inspiration! no lie- I have been thinking of a tattoo that is yes- it is so true- so nailed it here babe.loved it. Funny the moments we mamas share … of course mine was today with a full on fever so was accompanied by an extra bout of guilt and weepiness. I loved this post! We had a pastor one time tell the congregation: “In your parenting, only say no when you can’t say yes.” Words to live by for us moms, who always feel like there are too many messes. And for good reason–there decidedly are too many! One of the reasons many of us moms homeschool is so that our kiddos have more creative time–more down time to discover what makes them tick. Takes a real commitment on our part to make their education uniquely theirs. I struggle with the NOs on a daily basis as well. Thanks for the inspiration to say YES! This really hit home for me, because it IS me! Thanks for giving me something to think about. Oooohhh– I hear this in my bones. Another mamma saying yes to saying yes. As I head into summer (with aprehension, I’ll admit), this is definitely something I needed to read today. Its so easy to forget just how easy it is, isn’t it? I’ve been a parent coming on thirteen years, and I’ve always prided myself on my “no”. It’s what they need, what they are looking for from me.But as they get older, that truth has softened it’s edges a bit, and I’ve wised up to the glory of “yes”.I’m working on it. Actively.This is the summer of Yes. You’ve said it better than I could, Molly. Thanks, and good luck. To both of us. tara. i just saw your daughter in her fanciest party dress on a rainy at-home day. i think you’ve got yes going on! i need to go out to dinner with you. badly. Am I allowed to say this? Attic24 blog had a lovely post (March 31st, 2009) titled “The YES-day” (filed under Children), and it was a lovely one day plan for saying “yes” for the day. If you haven’t seen it yet, I watched a video this morning that kind of puts everything into perspective, and now after reading your blog – – – it was a confirmation of that reality. Brilliant! I love the authenticity of this…. oh I can so relate…. I need to hear this too. You are wise, Molly. Thank you. this has really been on my mind lately. 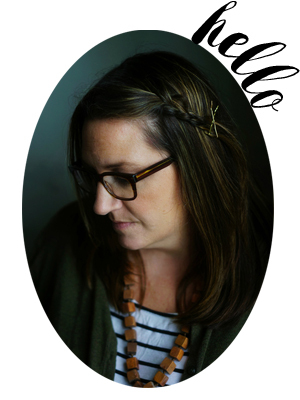 I want to be a YES mom…i have to resist the urge to say NO more than yes. Thanks for the reminder…great words! Oh I needed this reminder. I wrote a post called ‘saying yes’ back in May of last year and it’s just so easy to slip into saying ‘no’ to everything. I love this… maybe I ought to tattoo that on my hand! Oh, molly. I’m a “no” from tired and overworked overscheduled can’t-have-fun, too much to do. You are so, so right. Yes, we can make cookies and add sprinkles. I need better reasons for my nos.you are a wise mama and writer to share this with us. YES! I’ve been meaning to tack up signs all over the house that say “YES” and “LISTEN.” That’s all my little guy needs from me: non-impeded open ears and agreement, going along with his fantastic games and his clay creations. Thanks for another reminder. YES! you rock!! I’m going to write it on my hand tomorrow, too. Oh, I say no all the time too. You have highlighted a very important point here, one that really rings true for me at the moment. Let’s all find the energy and time to say yes more! I tend to use another word ‘maybe’ and really mean it. Sometimes you can’t give a yes or a no instantly. So the maybe gives both sides a few seconds to think without reacting. I often follow the maybe with a question. Like ‘Tell me why you really need..’ or ‘Do you really think that’s good idea?’ sometimes even ‘What do you think would happen if I let you?’It means when you do have to say no they feel part of the decision process. It even helps them to think things through before they ask. It does tone up their persuasive language too but that’s a good thing in life! this makes me teary because everything you wrote…thank you. No is so much easier. It requires no energy, no commitment, no effort. Totally hear you. I often say “maybe” which is a stalling tactic. It means not right now, but maybe under other circumstances-gives me time to think. The kids get excited when I say maybe, even though I think of it as a no. But they do get sneaky. I have one who always turns the TV on or goes to the computer when he knows he’s not supposed to. I have told him he has to ask. He often asks when I don’t want him to, but I will negotiate; “If you have finished all your homework and you unstack the dishwasher, then you can go on the computer for 1/2 hour”…that kind of thing. I think yes doesn’t need to be a blanket statement. They still need us to set the parameters. Once again, Molly, an excellent post. one of my new years resolutions was to say yes to the kids more. it hasnt been easy. “yes” usually means more work for me. Lovely. I think I’ll be linking soon. When I had my first baby, a friend’s mom (at my request) gave me a list of things to remember as a mom. One of them was to say yes as much as I could so that when I felt like I needed to say no, the kids would understand and take it seriously. Sounded simple at the time, but has proven much more difficult. I love your sentiments. Thanks for the reminder. I’m not sure if you’ve ever seen this post by the gluten free girl, but it’s worth reading. Oh i hear you!!! I’ve been trying to say Yes to my girls more often especially my oldest Mia. Great post. Oh boy! Does this one ever hit home!So well said, Molly, as always, you make me smile and think and laugh and love you more. Great, great post. I think about this a lot. Thank you! I LOVE this post. I have a really hard time breaking the no habit. The part that really struck me here was how much is going on inside that little mind that needs OUT and how saying no can be a way to drive them to deception. I’ve been working out a post in my head about fostering honesty in children, and I hadn’t even started thinking about this angle. And it’s a very important angle. Thank you. Thank you for that. I too know that I say no far too often to my 3 and 6 year old girls. Now that we are on summer vacation, I plan on trying a lot harder to say yes more often to those mess making time consuming ventures they want to get into. Someone might have mentioned the idea already, but we did a “yes-day” last summer for my older child and it was really great. She is already asking when her day is this summer. We let her pick fun things to do and basically, it was just as fun for me to break some of my usual rules. Even saying yes to the little things was so liberating. This is a tricky one that I wrestle with, too. My No’s usually revolve around the mess I know I’m going to have to clean up in the kitchen… and really, what’s the harm?? After I read this I almost went to another page, but as I scrolled up to click the link my eyes filled with tears and I had to leave you a comment. Thank you for this though provking post. I really makes me want to be a nicer, yessyer mom. Thank you. absolutely what Angel Funk said. And thank you. Perfect, perfect, perfect. I soooo need to work on saying yes more. What do I have to loose? Molly you say it so well. All of it is so very, very true! Oh, yes, yes, yes, it sure is!! Thank you so much for this reminder! I need it- daily! As a once-child of a no mom, I applaud and affirm you. I feel that my mother’s knee jerk noes more than anything stifled my imagination and creativity. So, good for you! 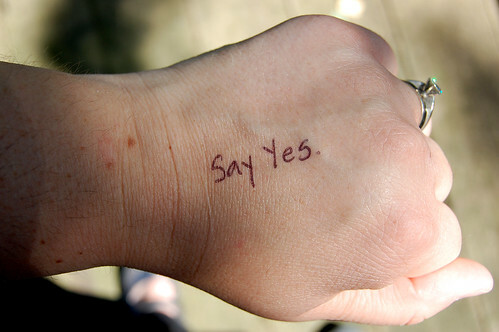 A good thing to think about…when to say no or when to say yes. Sometimes, I think that I just don’t take the time to think, to weigh everything before a ‘no’ pops out of my mouth. However, according to my children, I think I’m more of a ‘maybe’ or ‘possibly’ person – which can drive everyone a bit nuts. seems like we’ve talked about this before, Molly. Thank you for reminding me today. such a cute picture!! i saw it on habit and just about had a fit over how cute it is. Oh, how this post resonates with me. I have actually resorted to putting a rubber band on my wrist that I can snap to remind me…I hate when I blurt out a no or sound harsh and don’t mean too….I don’t want to harm that little spirit of theirs (three under the age of six) but sometimes life does seem to get in the way. I also have a link to a parenting prayer by Mimi Doe on my blog that I read every day. I have it in the dashboard of my car as well…Be positive, say yes, BE there, mindful and present. Hard some days but I can tell when my attitude is good, theirs is good. I really love this. And I agree. Time to stop saying ‘no’ as a knee-jerk response. wow, so close to home. I got a little teary eyed, just reading it. So hard to be the mom you strive to be sometimes. I’ve been so full of “no’s” myself lately. I think I needed to read this! I can so relate to this. My 2 year old has known her own mind from day one and I’ve only just realised that me yelling, saying no, trying to DEMAND she does as I ask simply doesn’t work. Instead I’m asking the same things, but being more patient, trying to give her time to come to her own answer and she generally isn’t unreasonable. I also have to remember to let her try more – when I think of the hours my first child got of my undivided attention. I know we’re only human but your’e right sometimes they say the simplest thing and you just think – awwww! Thank you. You just wrote down my whole existence with my five-year old. Wow. Seriously. Thank you! what a good reminder, thank you! Thank you for this… so often I say NO too… we miss out on so many blessings/memories. this made me cry a bit. So many time I have stoped my child with a quick no..SO many time was I stopped. Even though my mother is a creative genius and I am quite crafty myself. And yet I still foundmyself saying no, out of inpatience, and hurried life. I wish I had not said no.I will not in the future. The idea of having to steal to create art, Well it’s painfully beautiful. Thank you for giving us this peice of wisdom. What a great post! Thanks!!! I’ll need to keep this in mind. I LOVE this-thank you for encouraging me to surprise my kiddos with yes and let them try out their ideas.